James Hinchcliffe on the streets of St. Petersburg, Fla. 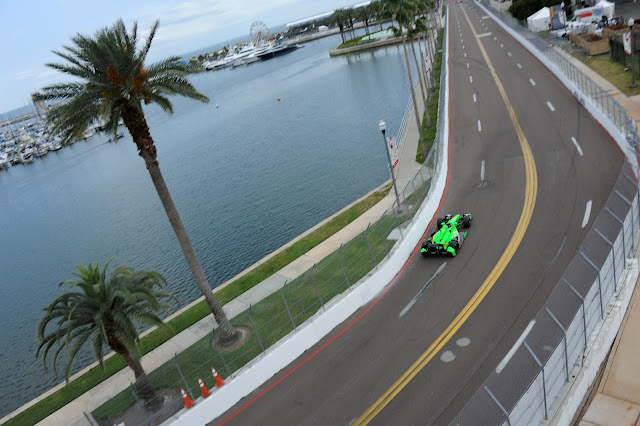 While NASCAR's top two series prepare for the season's fifth race at the California track where the IZOD IndyCar Series ended 2012, the open-wheelers invade St. Petersburg, Fla., for their season opener. Last season saw some of the series' best racing in years. The introduction of the new Dallara chassis and the inclusion of engine manufacturers other than Honda, as well as racing on a variety of tracks with a colorful roster of drivers gave the series plenty of drama, ending with Ryan Hunter-Reay winning the first championship by an American driver since Sam Hornish Jr. did it in 2006. The 2013 season starts with some compelling storylines. Four-time champion Dario Franchitti hopes to equal his friend Jimmie Johnson's number of championships. The Scot finished seventh in points last season, his worst finish since 2006, so he'll be up on the wheel. Aussie Will Power, who has probably the best name of any racer not named Andretti, finished second in points the last three seasons. In 2010 he led the championship hunt for 15 of the 17 weeks. In all three seasons he was in front going into the season finale, amassing 14 wins in 49 races while Franchitti, the 2010 and 2011 champ scored just 8 and Hunter-Reay won 6 over that same period. Despite his prowess on the track, Power's probably best known for his double bird-flip to IndyCar race control after they restarted a 2011 race at New Hampshire Motor Speedway — with the track still wet. Danica Patrick spun, chaos ensued, Power got caught up in the wreck and displayed his displeasure quite openly on national TV. Power and Hunter-Reay topped the speed charts at St. Pete on Friday. Hunter-Reay became a first-time father during the off-season, but the sleepless nights that come with a new baby don't seem to have slowed him down any. The Mayor of Hinchtown, James Hinchcliffe ran second in the first practice of the day. Beginning his third season, the Canadian has a lot to prove with only two podiums in his first two seasons. His personality makes him a popular spokesman for the series, but he'll need to step up his performance to stay at Andretti Autosport. Third-fastest in final practice, Switzerland's Simona de Silvestro showed that moving to the KV Racing Technology organization — with Tony Kanaan as her teammate — could be the best move of her career. The 2010 Indianapolis 500 Rookie of the Year now has the horsepower to go with the skill that's earned the respect of her peers. That's just a taste of what's to come this season. Qualifying for the Grand Prix of St. Petersburg starts at 2:55 p.m. (ET) Saturday and the race airs Sunday at noon (ET) on NBC Sports Network and on IMS Radio Network, XM 211/Sirius 211. The IndyCar.com website will have live scoring and timing. Sebastien Bourdais holds the track record on the 14-turn, 1.8-mile street circuit, and Helio Castroneves is the defending race winner. "Honda Grand Prix of St. Petersburg"
"Honda Indy Grand Prix of Alabama"
"Toyota Grand Prix of Long Beach"
"Chevrolet Indy Dual in Detroit (1)"
"Chevrolet Indy Dual in Detroit (2)"
"Honda Indy 200 at Mid-Ohio"
"GoPro Indy Grand Prix of Sonoma"
"Shell-Pennzoil Grand Prix of Houston (1)"
"Shell-Pennzoil Grand Prix of Houston (2)"